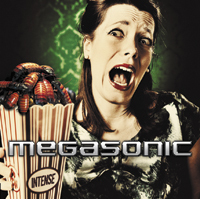 MEGASONIC are a Metal band from Belgium. If you are a fan of 80s Heavy Metal in the vein of WHITESNAKE, RIOT, and maybe even ARMORED SAINT, then the group’s debut album, “Intense,” might be right up your alley. For their first recorded effort, MEGASONIC do a lot right from the onset, bursting out of the gate with aplomb on the driving “Bombs Away” after a short instrumental intro. “Demon’s Lust” and “Witches Brew” rock hard with their bruising riffs, the latter possessing an almost EXTREME-esque groove, while “Future Shock” sees the band turn things up a notch in what is probably the fastest and heaviest song on the album. Now, I’m into ballads in general, as long as they’re done right, but while “Love Lost Love” has its moments, it’s not as gripping as one might hope. Things don’t get better with “Man In The Moon,” as its overall mood and painfully clichéd lyrics really put a damper on things. It would be one thing if there was some novelty to it, but it feels far too obligatory to take seriously. Thankfully, these songs are the exception rather than the rule; aside from this late-album misstep, the band mostly closes strong with “Run For Cover” and the powerful “Eye of the Storm.” Songs like the latter make me wonder why solos aren’t a bigger part of the band’s sound, because they definitely are a strength, but are used sparingly throughout the album. I also liked the cover of ABBA’s “Does Your Mother Know,” which ends the album in high spirits. My biggest criticism of the album is just that it feels too safe. The bulk of the music on “Intense” radiates enthusiasm, and the band members, who are all multi-instrumentalists, perform very well. However, they never really take any challenges musically, and even the better cuts from the album can feel predictable to a point if you have ever listened to Metal of this sort before, and that’s just the problem. They sound like they’re trying to be a certain “kind” of band. If they are ok with that, then more power to them, but there is definitely potential here should the band try to diversify their approach, and maybe work on their lyrics, on future works. “Intense” is a solid effort for fans of Heavy Metal. It’s pretty solid from top to bottom, but it’s probably not going to blow you away.